You have more apps than you know what to do with, but Cover could fix that. It’s an Android lockscreen replacement launching (invite-only) today that adapts to show your top productivity apps at work, favorite chill out apps at home, and driving apps in the car. With a $1.7 million seed led by First Round Capital, Cover is proudly Android-first and -only, and could expose the inflexibility of iOS. Cover couldn’t work on any other OS. It leverages all the super powers of Android — replacing the lockscreen, knowing when you use your other apps, monitoring your sensors to determine what apps to bring up, and even modifying your ringer settings on the fly. Once you sign up for a Cover invite and get one, the startup puts you in its beta tier and you’ll see Cover in the Google Play Store. Once installed, it takes over your lockscreen, but leaves your homescreen launcher and all the customization you put into it intact. The only set up questions it asks are your work and home address. Cover establishes a geo-fence around these locations and whenever you go there, the left side of your lockscreen shows a column of six of your apps that fit that situation. At first, these suggestions are crowdsourced, so you’ll see popular business apps like Google Drive, Dropbox, LinkedIn, and Asana at work, or Netflix, Kindle, and Facebook at home. With time, though, Cover learns your habits and personalizes itself to show your favorite apps for these occasions. Cover’s “Peek” feature is the fastest way to open apps I’ve ever seen. Start pulling an app icon to the right and the lockscreen slides away to reveal the app’s innards as if it was open all along. This makes it remarkably quick to check notifications in a slew of apps. Cover’s rapid app-switching lets you drag down from the top right corner of your phone at any time, even inside other apps, to reveal shortcuts to your most recently used apps and top ones based on your current context. It eliminates all those extra homescreen buttons so you can quickly jump back and forth between maps and messaging. It was hard not to be impressed by Cover. The right apps at your fingertips which you can instantly preview and bounce between. And since I typically carry and iPhone, it made me a bit jealous. That’s a dangerous concept for Apple, whose business is built on being coveted. Meanwhile, the Android software is advancing by leaps and bounds. There are still magical flourishes in iOS 7 that give it unmatched polish, but without as big of a hardware or software advantage, Apple’s price points could get harder to swallow. Its lack of flexibility isn’t doing Apple any favors. The last few years we’ve seen a wave of powerful Android-only apps emerge. There’s auto-categorized contextual homescreen Aviate, crowdsourced phone book and call-blocking app Mr Number, and even the maligned Facebook Home. (Aviate and Home are both Cover competitors, but wash away your carefully organized homescreen while Cover is a hide-able layer on top). They’re are all powerful, but either a bit complicated and niche, or change too much of your phone’s experience. What they succeed at, though, is making iOS look rigid. Whether it’s Cover or another, if there’s a blockbuster hit Android-only app, it will expose the stubbornness of the closed iOS development platform, and combined with rapidly improving Android hardware and software, could make a bunch of people ditch their iPhone when it’s time to upgrade. Honestly, I wouldn’t be surprised if Cover was the messiah of Android. It provides a ton of value with minimal work, and you don’t have to sacrifice your existing customization. 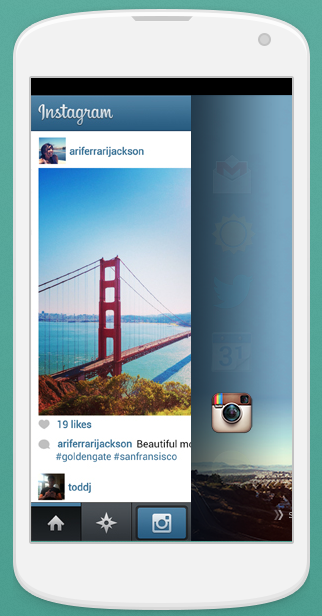 With one swipe, Cover disappears and reveals your old homescreen with all your folders and widgets. Investors believe too. Along with Josh Kopelman andFirst Round Capital, Cover’s $1.7 million seed round comes from Harrison Metal Capital (Michael Dearing), Max Levchin, Scott Banister, Charlie Cheever, Keith Rabois, Dave Girouard, and Alex Franz — a mighty cap table. They’re betting on a team that really understands context. Jackson was a product manager at Google from 2004 to 2011, where he led feature development on Gmail for four years before working on News Feed and photos at Facebook for a year. Co-founder and CTO Edward Ho was a product director at Google+ from 2011 to 2012, and a Google software engineer for four years before that. Co-founder Gordon Luk brings design and user experience chops with him from his work as an indie game developer after selling the events company Upcoming.org he co-founded to Yahoo in 2005. Together, they’re looking to hire Android developers who are sick of just porting iOS apps. “There are lots of talented Android engineers stuck at iOS-first companies.” While Cover is simple, it’s still a radical new way to use your phone. It’s challenge, and the easiest way it could fail, will be trying to fundamentally change our mobile behavior. While Cover could be great for users, it may actually help other developers too. People are becoming weary of downloading too many apps because it’s a pain to organize them and tough to remember to use them. Cover could wash away that mental cost of downloading more apps, allowing other devs to find an audience. It might even be able to make money on discovery. While Jackson was adamant that the first two phases for Cover are building a great product and growing its userbase, eventually when it monetizes, it could be by suggesting apps for the right occasion that you haven’t downloaded yet. Imagine going to a tech conference where you didn’t know there was a schedule app. Cover could see everyone else in your vicinity is using it, and suggest you download it too. Loyalty app companies might pay to have their apps suggested when you’re at restaurants they work with. Or if you’ve been playing games for 20 minutes, Cover might recommend other apps by your favorite developers…if they pay. One day, Cover could even take contextual computing beyond managing your apps, and use your surroundings and habits to deliver you pure information. Jackson dreams aloud, “Imagine if Cover v2 could prioritize push notifications. When I get Fab (shopping app) notifications at work I never open them but at home I do.” Cover could know to save those alerts until you get home. It could bump up the frequency of breaking news notifications when you’re using leisure app, but mute them in the car.